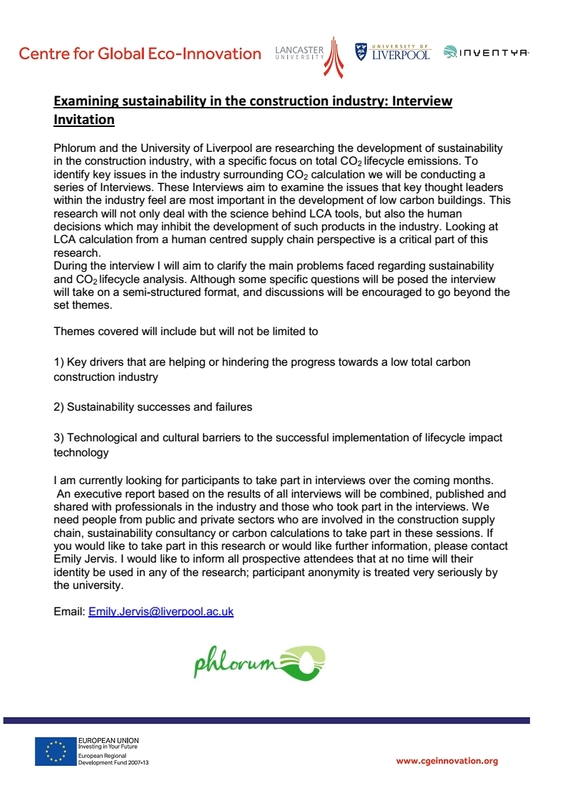 Phlorum and the University of Liverpool are researching the development of sustainability in the construction industry, with a specific focus on total CO2 lifecycle emissions. To identify key issues in the industry surrounding CO2 calculation we will be conducting a series of Interviews. These Interviews aim to examine the issues that key thought leaders within the industry feel are most important in the development of low carbon buildings. This research will not only deal with the science behind LCA tools, but also the human decisions which may inhibit the development of such products in the industry. Looking at LCA calculation from a human centred supply chain perspective is a critical part of this research. The interviews aim to clarify the main problems faced regarding sustainability and CO2 lifecycle analysis. Although some specific questions will be posed the interview will take on a semi-structured format, and discussions will be encouraged to go beyond the set themes. We are currently looking for participants to take part in interviews over the coming months. An executive report based on the results of all interviews will be combined, published and shared with professionals in the industry and those who took part in the interviews. 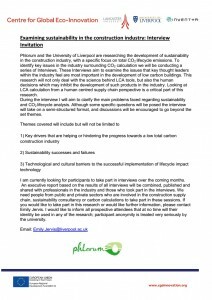 We need people from public and private sectors who are involved in the construction supply chain, sustainability consultancy or carbon calculations to take part in these sessions. If you would like to take part in this research or would like further information, please contact Emily Jervis. We would like to inform all prospective interviewees that at no time will their identity be used in any of the research; participant anonymity is treated very seriously by the university.